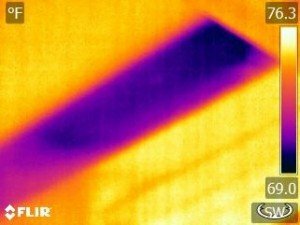 An Infrared Insulation Survey Can Save You Money! Do you live in an older house? Is your house cold and drafty? Do you wonder if there is insulation in your exterior walls? Are you considering hiring an insulation company to better insulate your home? Keeping warm in an old house can be difficult and costly. Often, houses built before 1940 were rarely insulated, and if they were, the insulation products originally installed may have settled over time, allowing heat to escape and/or the cold air to enter the living space. The most common insulation retrofit for old houses is loose fill because it can reach places where it’s difficult to install other insulation. It also has the least effect on existing finishes. Common places where your house may be losing heat—such as the walls, roof, and attic floor—are good targets for installing insulation. Before you spend the money on insulation . . . Consider hiring Puget Sound Infrared to evaluate your home. With the use of infrared technology, we can conduct an IR survey of your home and pinpoint those areas within the exterior walls that are void of insulation. Our service is unobtrusive, non-destructive, and won’t break your wallet. 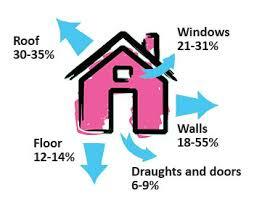 We can do before and after IR surveys to ensure quality work from your insulation professional. IR image showing missing section of insulation within rafter cavity of cathedral ceiling. At Puget Sound Infrared, we create detailed, high-quality and easy to understand report documenting missing insulation in exterior walls. Insulation professionals can then use the information to accurately insulate each wall cavity, thus insuring that you save money on energy costs. Plus, you stay warmer in the winter and cooler in the summer. Pete Sutch – Level 3 Certified Infrared Thermographer #66019 – Authorized Contractor with United Infrared Inc.